In one of the best Premier League title races I have seen, congratulations go to Manuel Pellegrini and Manchester City, who won the title for only the fourth time in their history. Commiserations to Liverpool and Chelsea, who played a massive part in making the title race so interesting for millions of fans across the country. Arsenal finish a worthy fourth having wrestled a Champions League spot from Everton, who played some blistering football this season, especially at Goodison Park. The fight for survival at the bottom of the table was just as competitive. Sunderland retained their Premier League status in spectacular fashion, sending Norwich City back into the Championship. Fulham also find themselves back in the second tier after a turbulent period which saw them employ three managers during a nine-month spell, while Cardiff City are also down after their early-season promise failed to last the distance. 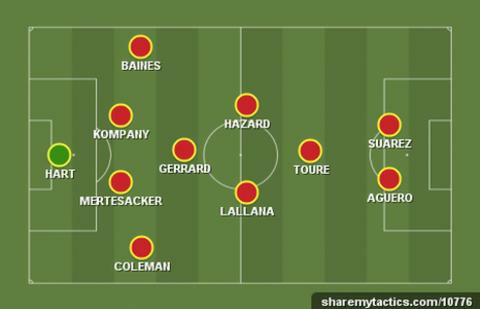 Take a look and see who has made my team of the season. There have been some notable performances from a number of goalkeepers this season. Julian Speroni's save from Eden Hazard against Chelsea was a turning point in Crystal Palace's season. And to think that, after all the heroic saves Cardiff's David Marshall pulled off, he still couldn't stop them going down. However, in the final analysis it's Hart who wins my selection. After a poor start to the season and the witch-hunt that followed, he recovered magnificently and went on to produce some title-winning performances. It's not how you start that defines your season but how you finish. Did you know? Of regular keepers, only Petr Cech (127) and Artur Boruc (99) conceded a goal less frequently than Joe Hart (every 93 mins) in the Premier League this term. Last season, it was Branislav Ivanovic who made my team, and once again he's had a strong season. Pablo Zabaleta has produced some fine performances and would have been an easy choice to make now Manchester City have won the title. But no-one has impressed me more at right-back, or attacked with as much purpose, as Seamus Coleman. The full-back has had a superb season. I cannot mention Coleman without acknowledging the contribution made by Everton boss Roberto Martinez, whose style of play has had a significant effect on the defender's development. The player Arsenal fans affectionately refer to as the "big friendly giant" has had a wonderful season. The German has played a massive part in getting the Gunners into the Champions League and to an FA Cup final. He has played more games than any other Arsenal player this season and, without his resilience and consistency at the back, they might have been in all kinds of trouble. If he performs anything like he has this season when Germany arrive at the World Cup in Brazil, they might be one of the European sides to pose a real threat to the South American teams. Did you know? Mertesacker played more minutes of football than any other outfield player for a Premier League club this season (all competitions, 4,605). This young man had a better season when Manchester City won the title in 2011-12. However, what the centre-back has demonstrated during another successful season is character. We have seen frailties in his defending - notably the error against Liverpool, when many thought he had single-handedly thrown away the title. Regardless, Kompany never lost faith in his ability to lead his team to the title, and Pellegrini clearly never lost belief in his captain. Did you know? Manchester City won 75% of their Premier League games with Kompany this term, but just 60% without him. I think it is telling that both Everton's full-backs make my team, and a further endorsement of the way their manager approached the season. The left-back has not just made his normal contribution to the Toffees' goal tally, he has grown into a player worthy of the captain's armband. He has also emerged from the shadow of Ashley Cole at international level. All he has to do now to emulate Peter Reid and Howard Kendall, two Everton greats with similar pedigree, is win the league title. No pressure then. Did you know? Created more chances than any other defender (49), as well as scoring five goals. To think that a mere slip against Chelsea should rob Steven Gerrard - arguably the best player of his generation - of lifting the Premier League title seems outrageously unfair. He may not have enjoyed the dream finish to the season that Liverpool fans so desperately wanted, but he could not have given any more to the cause. His sheer professionalism and dignified approach to the game makes him the perfect choice to lead England in the World Cup. Did you know? Made more assists than any other player this season (13), as well as scoring 13 goals. What a season this lad has had. I must admit I had some difficulty leaving Raheem Sterling out of the line-up, but while the Liverpool winger did finish the season strongly, Lallana has been brilliant throughout. Some of his performances were so complete they reminded me of former Sheffield United and Leeds star Tony Currie. Thrilling crowds with eye-catching performances, Lallana has justified his step up to the England set-up this season. The big question now is can Southampton keep him? Did you know? Lallana has created more chances than any other Englishman in the Premier League this term (71, seventh overall). I thought the way Jose Mourinho singled out Eden Hazard for criticism after the defeat by Atletico Madrid in the Champions League was strange. Was it not Mourinho who said that Hazard was the best young player in the world a few weeks earlier? Of course, that was when the Belgium international was practically beating teams on his own. Mourinho needs to be careful as it was this approach that was thought to have forced Arjen Robben away from Stamford Bridge to forge a successful career elsewhere. One thing is for sure, Mourinho will need Hazard next season if he's serious about winning the Premier League title. Did you know? Hazard created 92 chances in the Premier League this season. No player created more. I said halfway through the season that the contest between Yaya Toure and Luis Suarez was so close that it would take the title to decide who got my vote for player of the season. Well, the title has gone to Manchester City, and Toure gets my vote. When you score so many goals from midfield and prove to be the most valuable member of a Premier League-winning team, you deserve recognition. Did you know? Became only the second midfielder in Premier League history to reach 20 goals in a season (after Frank Lampard - 22 - in 2009-10). I was asked recently if I had the choice of selecting Aguero or Suarez in my team, who would I choose? My answer was: 'Why do I have to choose one or the other?' I would make room for both. I can't see a better striking combination in the world at the moment than Aguero and Suarez. How would they play? I'd let them work it out. Great players always do. Did you know? Had the best minutes to goals ratio of any regular Premier League player this season (a goal every 91 minutes). Love him or loathe him, you can't ignore him. Whatever your thoughts on the Uruguay international, Suarez has been breathtaking at times this season. There is no doubt in my mind that without Suarez, Liverpool would not have got anywhere near the title. To see him so emotional after the draw at Crystal Palace tells you just how much the title meant to him. That's what comes with wanting to win so badly. Did you know? Suarez was the Premier League's top scorer (31), while only team-mate Gerrard (13) made more assists than the Uruguayan (12). The custom in the Premier League is the manager who wins the title normally wins the manager of the year award. That is not to say I don't acknowledge the success Manuel Pellegrini has had in his first season at Manchester City, or the glorious football displayed by Brendan Rodgers's Liverpool. I only ever have a problem with that premise when the winning manager has a team with the biggest squad, or the most money at his disposal. Tony Pulis has had none of those resources. Most managers demand a budget for transfers you could run the National Health Service on, plus numerous guarantees before they even consider taking a job with far less risk to their reputation than the one that was facing Pulis. What followed in the four months after he took the reins at Crystal Palace was one of the greatest transformations I have ever seen in a football club. We were told that his players were inferior, the fans indifferent and the stadium in disrepair. What Pulis did was inject belief into his players, a sense of real hope into the fans and turned the stadium from a dilapidated arena into a fortress - and all with little money. That is genius, and that is why he is my manager of the season. Did you know? Had the Premier League started the day Tony Pulis managed Crystal Palace for the first time, the Eagles would have finished eighth in the table.